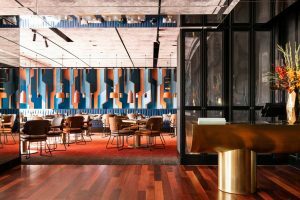 Having only opened its doors for three months, QT Perth’s Santini Bar & Grill is already a favourite among locals and travellers alike. With its Mediterranean flare and Executive Chef Nic Wood at the helm, the hotel’s signature restaurant is cunning in its simplicity, letting the locally foraged produce take centre stage. In collaboration with Robert Marchetti, QT Hotels & Resorts’ Creative Food Director, the concept of a restaurant inspired by Mediterranean cuisine and culture was born. Spending the last twelve months meeting with local growers and producers, Marchetti and Wood offer guests a truly authentic experience wisely guided by the seasons and the teachings of the boot-shaped land. Previously holding Executive Chef roles at QT Falls Creek and QT Canberra, Wood has returned to his hometown of Perth to take the reins of his own venture and into the kitchen at Santini Grill. Wood said, “Being back in my home town, I wanted to create a concept that celebrated food from the sun, using amazing WA produce. Guests can expect an abundance of flavour and dishes that are paired back, as they were intended”. Showcasing the finest produce of the region and leaving it unadorned, signatures include Bistecca Fiorentina, a sea salt crusted, dry aged pasture fed Cape Grim beef t-bone cooked over wood and lava rock and designed to share. Cacio e Pepe Clam pizza accompanied by 24 months aged pecorino, mozzarella, burrata and spiced pancetta and Wood Grilled Fennel Crusted Tuna Belly served with fine cut garlic-rosemary vegetables, Jerusalem artichokes and Tuscan “Dwarf” pickled peaches hero on the table. The bustling open kitchen offers foodies a glimpse into a world of smoky wood fire rocks and hanging handmade pasta, Fremantle Octopus and line-caught calamari. A strong Italian influence continues to feed into the dessert menu with Blood Orange and Campari Granita and an old-school 1988 recipe for classic, iconic Tiramisu – heavy on coffee with handmade sponge and fresh house-made mascarpone. Early risers won’t be forgotten at Santini Grill with Buckwheat Strawberry Pancakes topped with lemon ricotta, hazelnuts and cinnamon sugar and Abruzzo Cacciatore Breakfast complete with fried eggs, grilled cacciatore pork sausage and roman rosemary potatoes to appease all morning appetites. 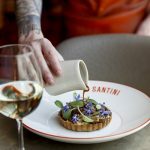 And for those looking for a night cap, Santini Bar acts as the hotel’s social hub; a downtown hideout – moody, intimate and splashed with intrigue – where cocktail hour is every hour. 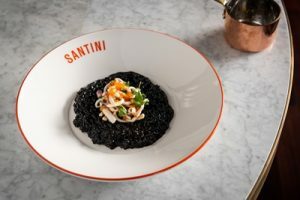 Having recently been awarded ‘New Restaurant of the Year’ at the 2018 WA Good Food Guide Awards, this highly regarded achievement cements Santini‘s position as a new favourite among locals. Open 7 days a week for breakfast and dinner, and lunch Wednesday to Friday, the restaurant’s evening menu focuses heavily on dishes designed to share, true to Mediterranean heritage.